Brodiaea santarosae is a newly-recognized species found only on basalt soils in areas currently or recently covered by the Santa Rosa Basalt of southwest Riverside County and a neighboring small part of San Diego County. It is the rarest of the southern California Brodiaeas, with just four known populations occupying only a small portion of an area only 10 miles long and 3 miles wide, plus a fifth very small population separated by 7 miles from the rest of the population. Specimens of B. santarosae have previously been confused with two other rare species, B. filifolia and B. orcuttii based solely on two internal parts of its flowers. Our studies have shown these specimens are very different from those other two species; we have found 11 total differentiating characteristics. Other specimens of B. santarosae have been thought to be hybrids between B. filifolia and B. orcuttii. That hypothesis is ruled out because B. filifolia and B. orcuttii only occur together well to the south of the Santa Rosa Basalt in San Marcos in San Diego County. In fact, we were lucky enough to find true hybrids of B. filifolia and B. orcuttii in San Marcos. Those hybrids are clearly distinguished from specimens of B. santarosae. Species found only on a given soil type are of great interest to botanists in how they have adapted to difficult soils such as basalt. In fact, a new book just came out in 2006 devoted to such species (Kruckeberg, A. R. 2006, Introduction to California soils and plants, University of California Press). Kruckeberg made a prediction in that book which was borne out by our recognition of this species: most new species will be in places .. with kooky soils..in such remote places ...as... out of the way places in southern California. B. santarosae may be an ancient species which colonized the basalt 5-8 million years ago and has survived as a distinct species to the present time due to its confinement to the basalt. Five million years ago is an important date in the evolution of southern California species. Prior to that time, southern California received summer rainfall, and the species found here were not very different from species found elsewhere in North America. After that time, we lost our summer rainfall and the climate became Mediterranean. 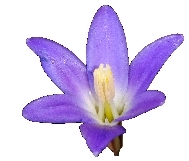 It has previously been speculated that genera with many species endemic to the California Floristic Province, such as Brodiaea, gradually adapted to the lack of summer rainfall, and radiated to form new species as new habitats became available, such as B. filifolia and B. orcuttii. DNA studies of the geographically-separate populations of B. santarosae may give a minimum age of this species since those populations were last in full reproductive contact. An independent estimate of when those populations were isolated may also be possible from modeling the erosion of the Santa Rosa Basalt combined with estimates of the distance over which Brodiaea species can spread. DNA studies may be able to elucidate the evolutionary relationship between B. santarosae and its neighboring species with small geographic ranges, B. filifolia and B. orcuttii. It would be fascinating to discover whether all three species evolved from a no-longer present parent species, or whether B. santarosae played a role in the evolution of B. filifolia and B. orcuttii. B. santarosae may be doomed to go extinct in the wild in the near geologic future (~100,000 years or so) unless it can adapt to non-basaltic soils, or unless there are viable populations present on basalt soil not derived from the Santa Rosa Basalt. All documented populations of B. santarosae, except one, are found on the Santa Rosa Basalt. At least 97% of the basalt has been eroded in the 8-11 million years since it formed. It will take much less than another 0.3 million years (3% of the previous erosion interval) to erode the remaining basalt since the basalt has now been broken up into small areas and is now being eroded on all sides. One population of B. santarosae, from Clay Hill just west of the Mesa de Burro, is found on soil that might be derived only from the basalt of the Santiago Peak Volcanics. If so, B. santarosae may be found on exposures of the Santiago Peak Volcanics elsewhere. Any such populations might outlast the Santa Rosa Basalt if the population size is large enough, and there continues to be suitable habitat on the Santiago Peak Volcanics. The name was published in mid-October 2007 in Madroño 54:187-198. Copyright © 2006-2007 by Tom Chester, Wayne Armstrong and Kay Madore.